Following yet another week in “Brexit Limbo” the UK grain markets have drifted lower still. With no significant market drivers at play, the London LIFFE wheat futures appear reluctant to do much of anything at the moment and the buyers remain quiet. Feed wheat for spot collection has retreated to £163.00/T ex-farm for spot collection, with the June position offered at £165.00/T ex-farm. As for soft wheat, values for June are struggling to make £170.00/T ex-farm now with spot collection offered at £167.00/T ex-farm. As for hard biscuit wheat, the market is pretty much non existent at the moment – any arising opportunities should therefore be worth some consideration. 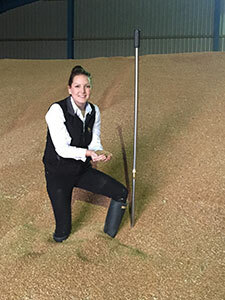 The premium on group 1 full specification milling wheat has also declined over the past week – £186.00/T ex-farm currently looks like a good offer for May collection. As for the new crop market, both the of the London LIFFE wheat futures and the premium over the on-screen value which the buyers are prepared to pay has declined over the past week. £140.00/T ex-farm is now offered for September collection, with the harvest position now less than this. The ADAS spring crop report is now available to view online. For the most part, I would say that it is very representative of our trading area although I would have said that spring drilling progress is slightly ahead of these estimations. Winter 2018/19, as a rule, “provided good conditions for crop growth. Mild temperatures and below average rainfall allowed crops to establish well, with good over winter survival”. In addition, soil conditions have allowed for timely applications of both winter pesticides and spring fertiliser. Currently, cultivations and drilling of spring crops are progressing well. As a result, a staggering 92% of the overall winter wheat crop is rated as “good-excellent”. Cereal crops in particular are in good condition, with low levels of weeds, pests or disease at the end of March. OSR crops are “more variable” – there are some good crops with good plant numbers alongside other poorer crops that have been severely affected by cabbage stem flea beetle. They estimate that around “5-8%” of the drilled area of winter OSR has been lost already, and there remains a small area that is of “questionable viability”. Regardless, disease and weed pressure in winter OSR remains low. As of the end of March, 46% of the planned spring barley area was drilled by the end of March with the majority of activity taking place in the South and East. Growth stages are dependent on drilling time, with he majority of crops either just drilled and germinating or just starting to emerge. There are a small number of crops drilled during the window of opportunity in late February that have two true leaves. (Worth a read if you have time). Elsewhere, the first USDA crop progress report was released yesterday, giving the opening indication of crop health in the US. The report suggests that the winter wheat crop, although still early in its development, is ahead of last year. 56% of the crop is rated as “good-excellent” compared with 32% at the same point last season. This has taken the market by surprise as recent flooding and excessive rainfall has raised concerns for crop conditions. Over the coming weeks, the market should become increasingly focused on the weekly crop condition reports from the US – depending on any Brexit-based distractions of course! Elsewhere, conditions throughout the EU and Russia continue to look favourable despite the on-going moisture concerns. Ukrainian winter cereal crops are currently rated as bring in the best condition for five years. Contrary to the US, the EU and much of the black sea region is suffering from a rainfall shortage and forecasts are mixed. Again, I would imagine that this will become more of a prominent concern longer term. Meanwhile, old crop OSR values are struggling to be £300.00/T ex-farm this morning after a surge in buyer interest pulled values up to £304.00/T ex-farm last week. According to the latest USDA report, the area planted to OSR throughout the EU for the 2019/2020 trading season is down by nearly 18% from the current trading season. This is the lowest area planted since the 2006/2007 trading season. However, the crops that have been planted and survived until now have recovered from their disadvantaged start in the dry summer of 2018. In the UK, between 5-8% of the winter OSR crop has been lost over winter. New crop values are around £298.00/T ex-farm for harvest collection this morning as the difference between the old and new crop market narrows.